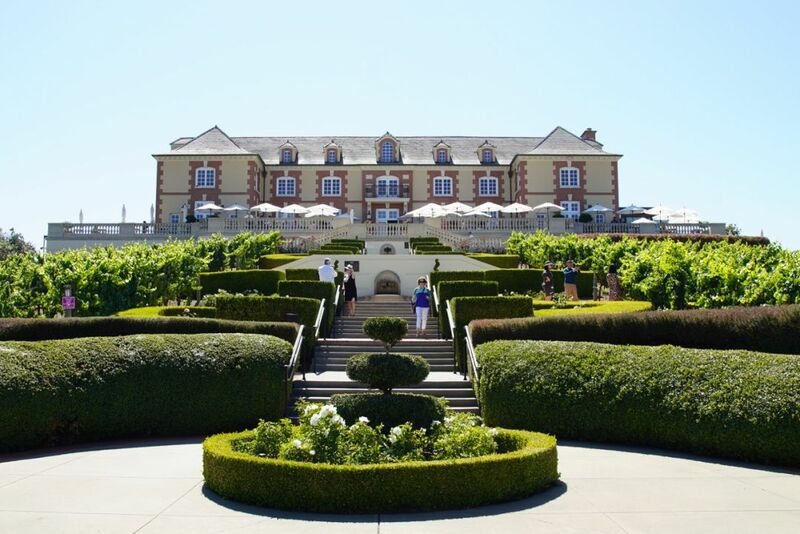 Domaine Carneros has long been a favorite of ours; combining a French-style chateau, stunning views, and great wines. Therefore, we were excited to have the opportunity to meet with Eileen Crane, the head winemaker, and president at Domaine Carneros. It is interesting that we all think of women in wine as a new concept, but it is important to note that Eileen has been at the top of her field for over forty years. *Note – In this post, visiting blogger Audrey Kruger from SanityFound was with me and took all of the photography as I was a bit under the weather..
Eileen grew up in an Italian family in small-town New Jersey. Her uncle’s wine cellar first sparked her interest in wine. When she was first allowed by her family to try sparkling wine, she was fascinated by it and decided to make that her career. Like so many of Napa’s winemakers, Eileen graduated from UC Davis’ Enology and Viticulture program. She was then hired by Domaine Chandon as assistant winemaker and then by Gloria Ferrer; two of Northern California’s most notable sparkling wineries. In 1987 Eileen was hired by the Taittinger family to create a new sparkling / Pinot Noir house. Two years later Domaine Carneros opened. While chatting with Eileen, she described Domaine Carneros as having an understated elegance; like Aubrey Hepburn in a black dress. Just that image alone made me smile and I knew exactly what she was talking about. I thought she described it perfectly. It is sparkling wine for which Domaine Carneros is best known but in 1992 they added still Pinot Noir to their range. We wrote about a dedicated Pinot Noir tasting back in 2016. The sparkling wine remains their focus; just 20% of production is Pinot Noir. 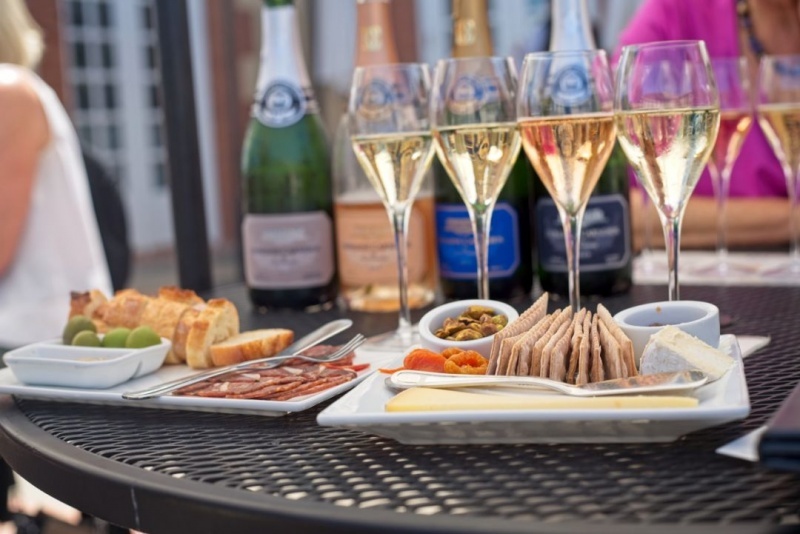 A selection of charcuterie and cheeses paired with the tasting flight of sparkling wine. 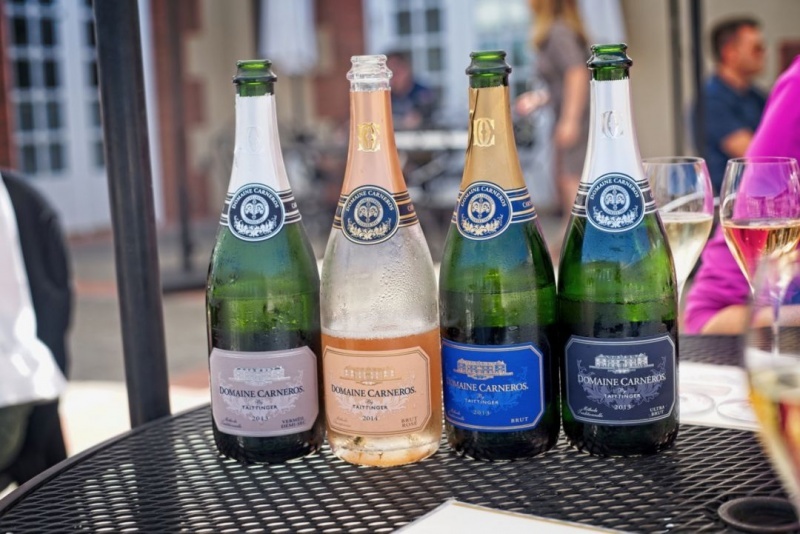 Domaine Carneros is a wonderful place for a tasting. The wine, as already mentioned, is first-rate, but that is just the start. The views from the terrace are beautiful and the inside seating offers an elegant setting. 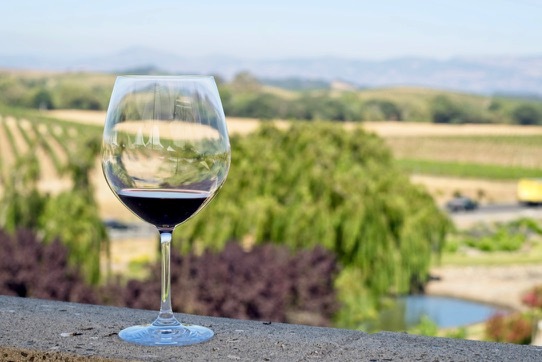 Unlike many Napa wineries, you can enjoy wine by the glass as well as tasting flights. The wine is supported by a variety of meat and cheese plates. My favorite pairing option is the salted chocolate caramels from Anette’s Chocolates. 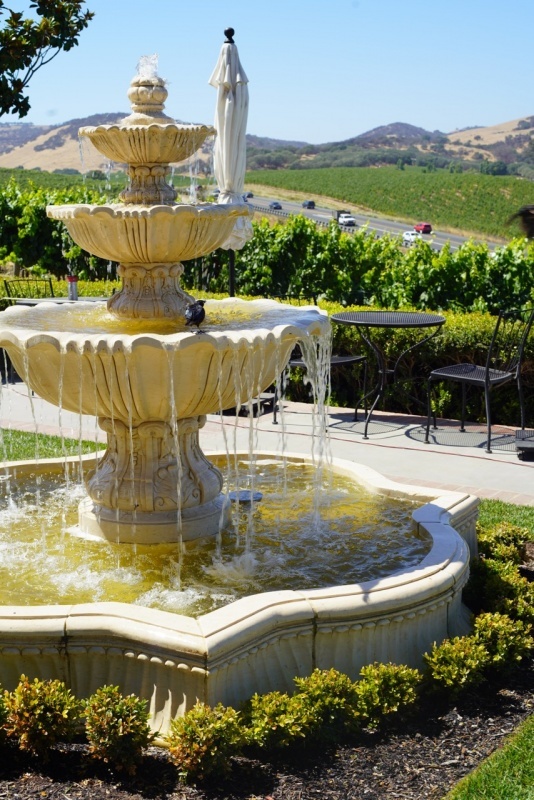 Classic architectural features and views bring this winery into a league all of its own. Eileen Crane told us that they are just about to open an Orangerie so that visitors can enjoy the views even when the weather is against sitting outside. It wasn’t quite done so I could photograph it, but keep checking out my Instagram account and I am sure you will see it when it is unveiled. 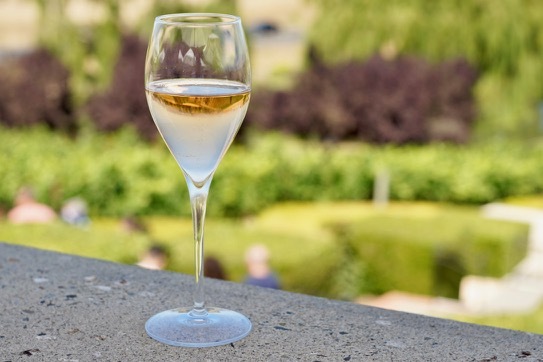 Domaine Carneros has a membership program that offers several benefits: a member only terrace and tasting room, complimentary tastings and tours, and reduced rates to special events. One of the most popular events is the lobster event, which started as an annual event; it now happens three times a year and they are considering adding a fourth. 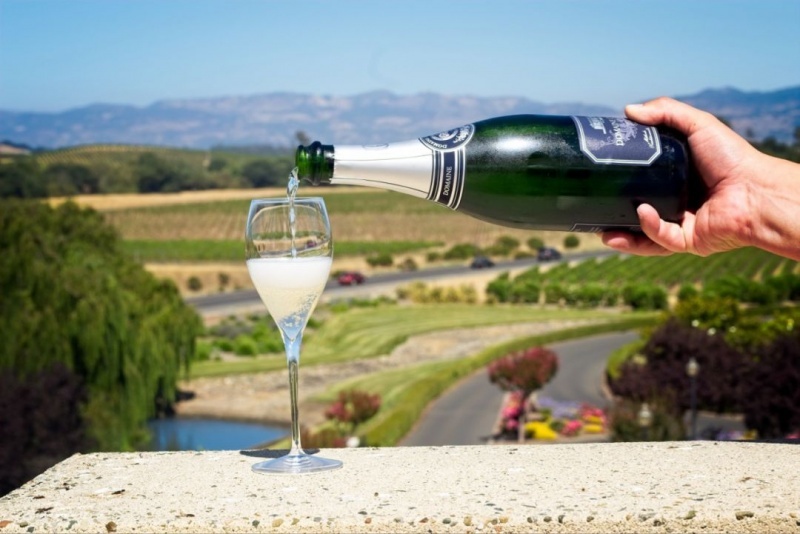 Sparkling wine being poured with the magnificent Napa view in the background. 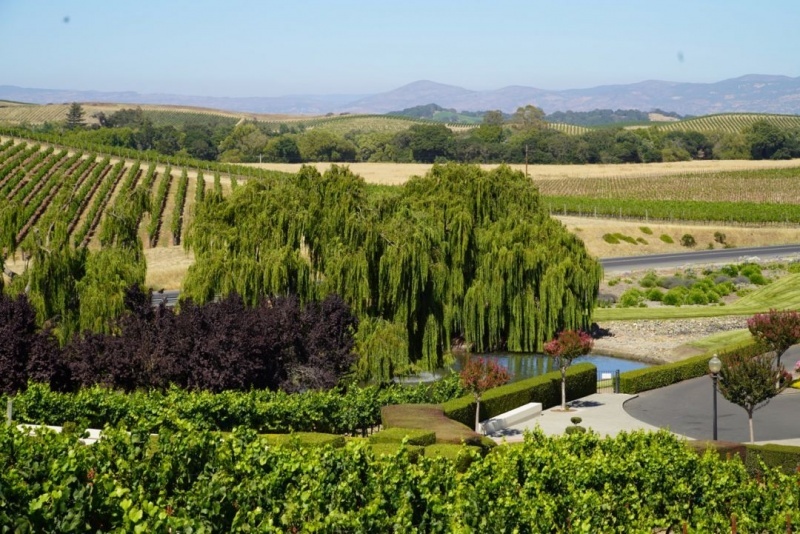 The thing that is truly remarkable about Domaine Carneros to my mind is the fact that they focus on making quality wines and quality with every aspect of their business. Some people see it as a tourist spot, but I disagree. You get a luxury experience from the moment you step onto the property. Luxury in every single element with wine quality to match. That is what makes it a popular destination for visitors and locals. 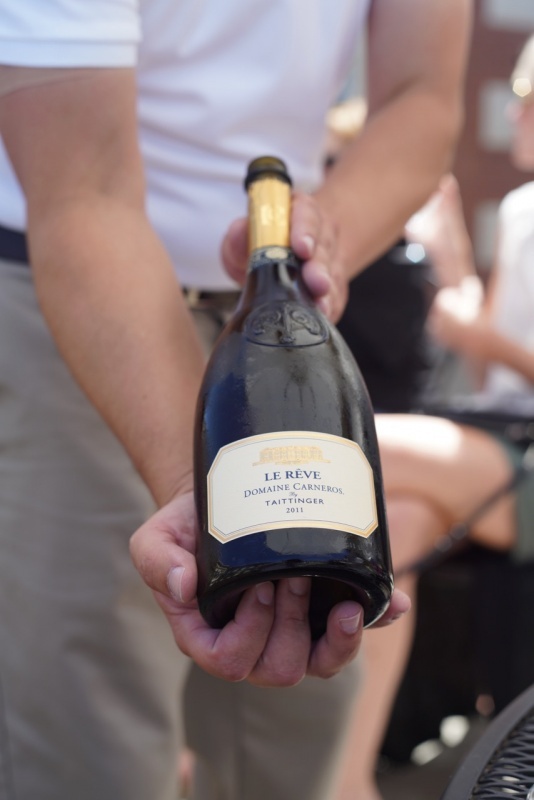 Le Rêve (The Dream) is their most premium sparkling wine and my personal favorite. Insiders tip: Get your reservation as your first reservation of the day and start your day with a toast of bubbly. You will find it much less crowded, and cooler in the summer to relax and enjoy the views. I walked away from the interview with an even bigger appreciation for Domaine Carneros and the amazing woman behind the scenes powering it. We remain loyal fans of this classic beauty and the wines she creates. We highly recommend visit on your next trip to Napa. Great post – especially the recommendation to get there early in the day. 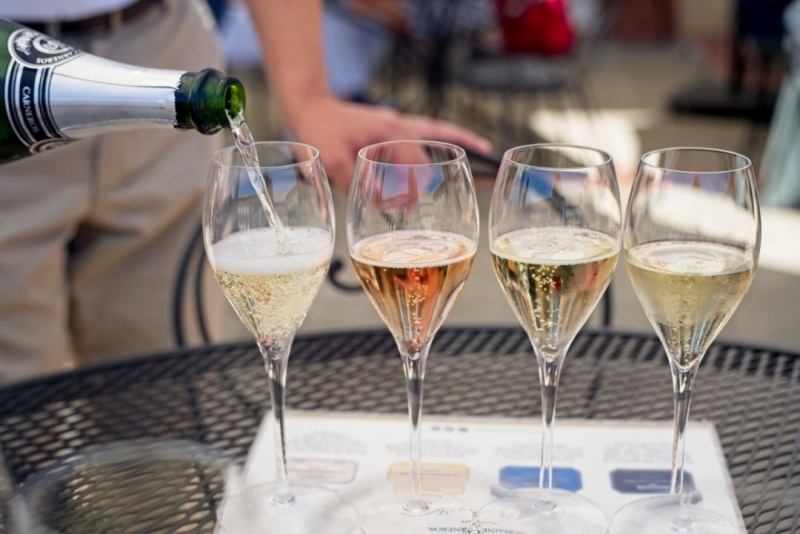 How better to kick off your morning than with a glass of bubbles? BTW, I’m trying to share your post via Twitter but the share button doesn’t appear to be working. Thank you for the heads up on the sharing. We now have it fixed I hope. Sorry I have been really under the weather so I haven’t been able to look at it. Glad you liked the post. I see lots of favorites here. Domaine Carneros is one of my favorite stops too. Nice article, Amber. Thank you so much. It was lovely to sit down with such a poised, intelligent woman and enjoy a few glasses of sparkling wine in that amazing setting. Definitely a highlight of my wine writing career so far. One of my all time favorite places! And my go to bubbles also!! I never knew she was from NJ! Yes, she’s so down to earth and normal. Seriously you’d love her.